As part of ongoing series giving insights into the diversity of Japanese film, Japan Society introduces audiences to a fresh look at the Japanese New Wave Movement which is mostly associated with names like Masahiro Shinoda or Nagisa Oshima. Eitaro Morikawa’s “The Tragedy of Bushido”, as part of this year’s series, is special in many ways, for it is the debut feature of its director and also the first jidaigeki film within the movement. Deeply embedded in the atmosphere of the time, it is a film about the conflict between the young and the old, about a system which has come to consume the young in order to live on. In the 17th century, the powerful Honda clan fears for its reputation. After two of its members tried to escape from committing ritual suicide, its elders fear the Shogunate might intervene in what is a profound violation of the samurai code of honor, the bushido. 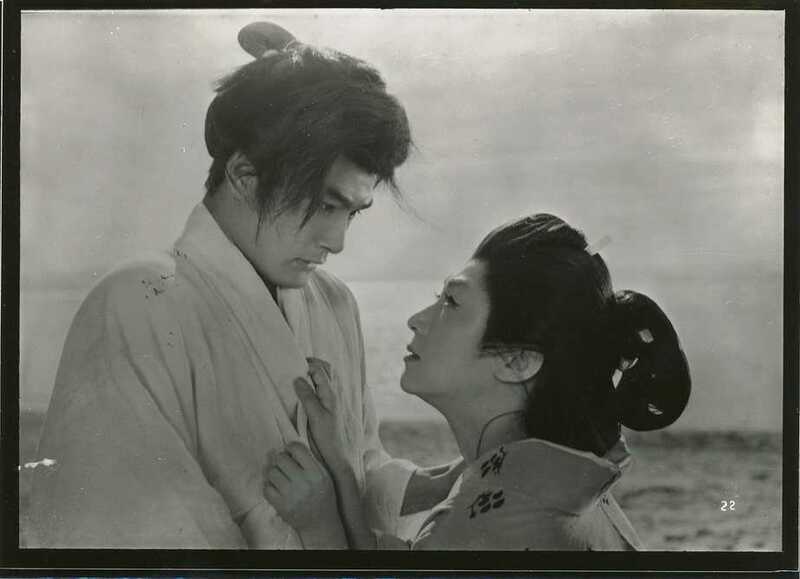 In order to keep their honor intact, its Chief Retainer commands Sir Nobuyuki (Miki Mori) to have his younger brother Iori (Junichiro Yamashita) commit ritual suicide and thus become a martyr. Even though Nobuyuki is shocked by the news he finds himself unable to disobey what the code demands and eventually convinces his brother to do as he is told. However, as Iori is led into confinement, each of his steps carefully watched by guards, Nobuyuki’s wife Oko (Hizuru Takachiho) becomes increasingly desperate because of the situation. Since his mother died, she has been taking care of Iori and to see him give his life at the age of 16 is an act of incredible cruelty in her view. One night, she pleads her husband to grant her one last wish, to see Iori one last time before his death, a meeting which will have severe consequences for her and her family as a whole. The movie opens with a quick introduction into the basics of what bushido is, a code of honor demanding loyalty from the samurai and their families above all. Considering most of the actions in the film will feel especially confusing to Western audiences, these pieces of information are much needed to put into perspective the internal struggle that specifically Iori and Nobuyuki go through during the course of the film. As a means to emphasize the film’s perspective on this code, which not only defines what is loyalty, but also decided upon people’s lives, a series of static shots shows the luxurious mansion of the Honda clan, making it appear like a fortress or a prison. Although the code seems transparent to its followers, the machinations behind it, the rigidity of the clan’s structure as well as the motivations of those giving orders remain hidden, at times arbitrary and even “heartless” as Nobuyuki states at one point. Interestingly, despite its emphasis on the melodramatic aspects of the story, Morikawa’s film seems like a precursor to works like Kobayashi’s “Harakiri” or even the “Lone Wolf and Cub”-series. In one of the first images one of the men ordered to perform ritual suicide is mercilessly hunted down by a number of men who eventually slay him with their swords. The brutality and mercilessness of the image come as a bitter reminder of the consequences of the orders characters like the Chief Retainer bark at their subordinates while insisting on bushido and their men’s loyalty. Additonally, the lack of emotion, especially with the male characters, underline the amount of control the code has on them as it stands above family as well as feelings of love. In such a male-centered society, Morikawa makes his female characters the first ones showing empathy for the fate of Iori, whose closest friends as well as his brother remain powerless and unable to do something about his death. In the end, “The Tragedy of Bushido” is an interesting film about the ruthlessness of a system based on loyalty, but which in reality serves those on top of the food chain. Its themes decaying structures and corruption of the old system will become key aspects of the New Wave Movement and remain two memorable points within the film besides the strong performances by the cast.